1838-1840s autograph album that belonged to Phoebe Gould Thurston, who was born at Berwick, Maine, in 1820. Many of the autographs came from across the Salmon Falls River at Great Falls, New Hampshire, where Phebe may have lived or been educated, and others were inscribed at Taunton, Massachusetts or by people from western Massachusetts.. One sentiment dates to later than the 1830-1840s era; it was left by Phebe's daughter Emily Greene Eddy. 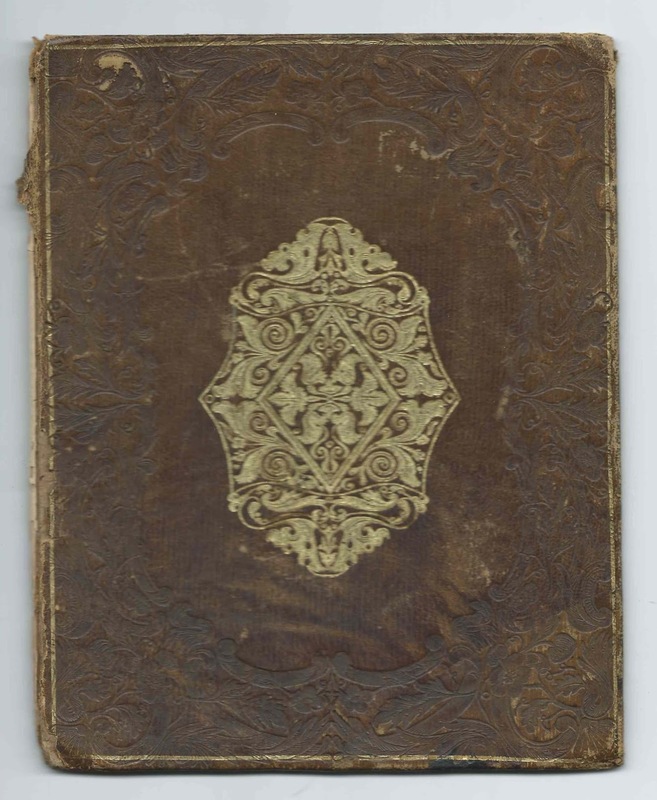 The album, published by J. C. Riker of New York, measures approximately 7-3/4" x 6" and is missing its back cover and possibly some pages at the back. It contains the sentiments of about 40 of Phebe's friends and relatives, a few of whom may have left more than one sentiment. An alphabetical surname list and an alphabetical list of the signers, together with any personal information they offered, appear at the end of this post. 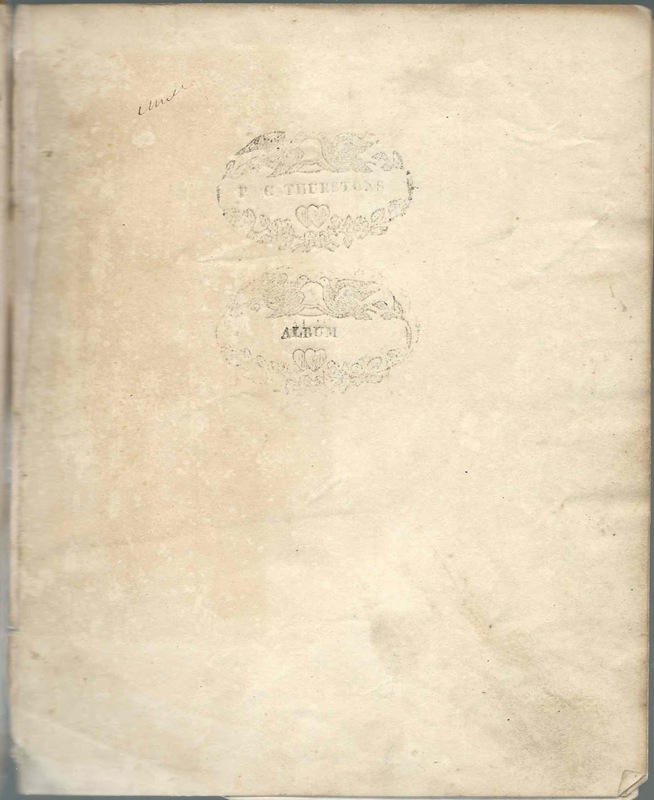 Notice that the title page has a sentiment inscribed on it, by S. J. McL., who may have been Sarah Jane McLellan of Newfield, Maine, based on the fact that two of Sarah Jane McLellan's siblings signed pages in the album: Nathaniel McLellan and Lois McLellan. 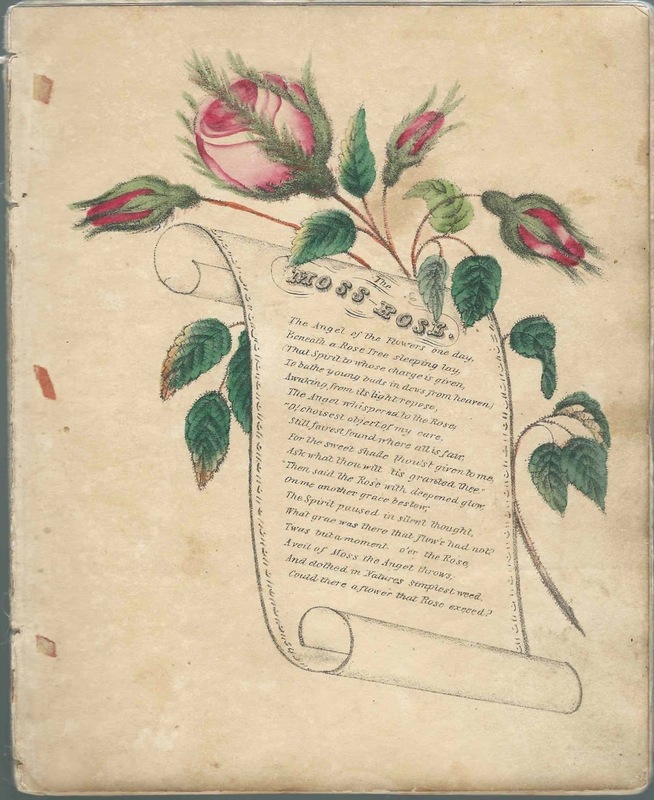 Four hand-colored floral illustrations, such as the one shown below, are interspersed throughout the album. Phebe Gould Thurston was born, I think, on August 23, 1820 at Berwick, Maine, the daughter of Andrew and Mary (Forbush) Thurston, however, I haven't found records to corroborate. On October 28, 1846, in Bristol County, Rhode Island, Phebe married Cyrus Barker Eddy, son of Ezra and Sally (Peckham) Eddy. Cyrus' first wife, Eunice (Dyer) Eddy, had died in May of that year, leaving four children motherless. Three of them would die fairly young. 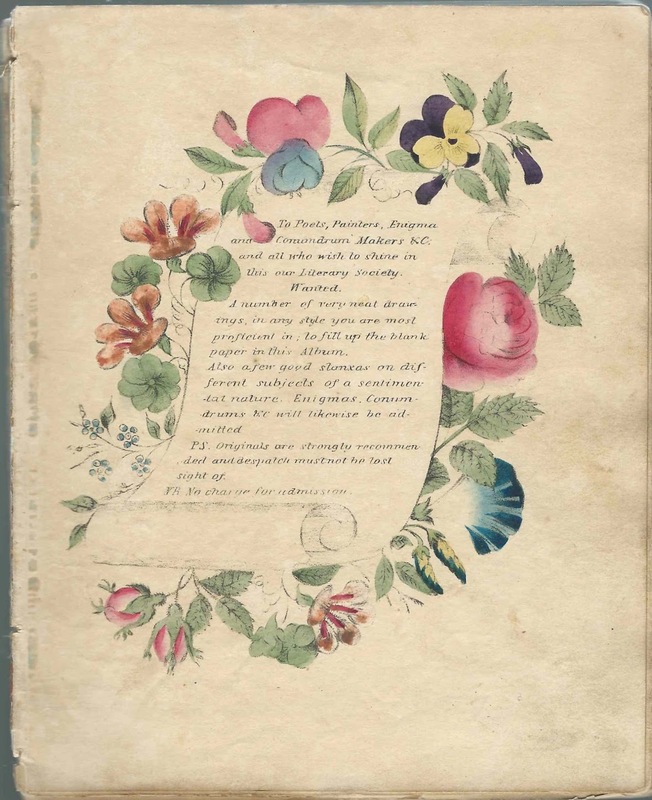 A page in the album was inscribed to "Miss Phebe G. Thurston", by C. B. Eddy of Bristol, presumably Phebe's future husband Cyrus Barker Eddy of Bristol, Rhode Island. Cyrus and Phebe would have five children, three of whom died young. 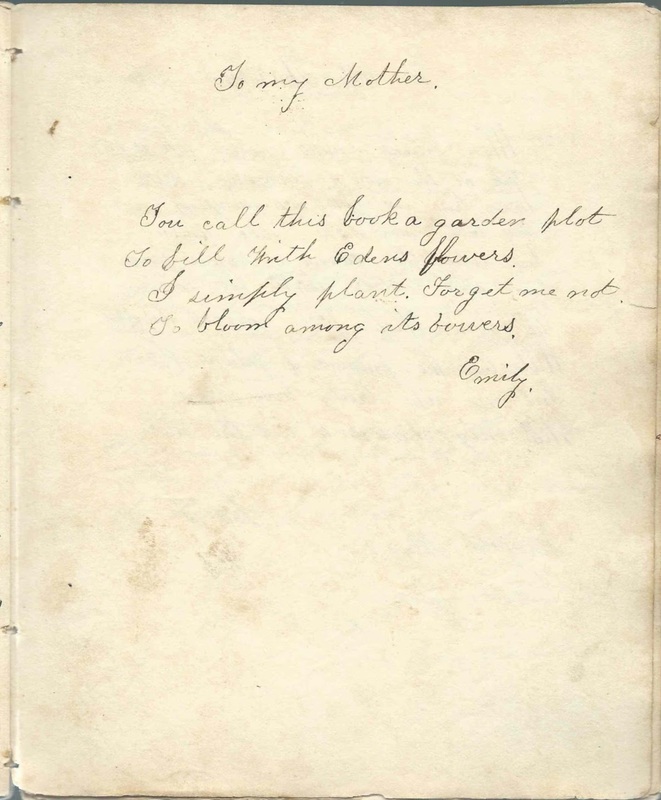 One of those who lived to adulthood, Emily Greene Eddy, inscribed a page in the album. She would marry William Henry Young. Emily's sister Ann Maria Eddy married Henry Edward Paull. Cyrus Barker Eddy died in 1876 and Phebe Gould (Thurston) Eddy in 1885. If you have corrections and/or additions to the information above, or information on any of the signers listed below, please leave a comment or contact me directly. 2-page sentiment by ? ; possibly initials S. H. or just H. or ? Emily; inscribed "To my Mother". She was Emily Greene Eddy, daughter of Cyrus Barker Eddy and album owner Phoebe Gould (Thurston) Eddy. Cyrus Barker Eddy of Bristol, Rhode Island, inscribed to Phoebe at some point before their 1846 marriage. An acrostic by C. E. Libby, inscribed at Great Falls on September 26, 1840; perhaps Calvin E. Libby of Great Falls, New Hampshire. John S. Runnels, inscribed to "Sister Thurston"
Sabra Sayward; presumably the Sabra Sayward, who was born in 1813 at Shapleigh, Maine, and married John Pike. 2-page sentiment by Elihu Scott, signed at Great Falls on August 8, 1838. Presumably Methodist Rev. Elihu Scott of Great Falls, New Hampshire; native of Vermont; husband of Louisa (Hale) Scott, native of Rindge, New Hampshire. Cyrus Thompson, signed at Somersworth, New Hampshire, on November 12, 1840. "To the Absent Daughter Miss Phebe Thurston"